Hello and Welcome to this post ,Today we are going to discuss the shortest and easiest methods of finding the Inverse of 2×2 matrix and 3×3 Matrix. Usually when we have to find the Inverse of any Matrix then we follow the following steps . 1 Check whether the determinant value of the given Matrix is Non Zero. 2 Find out the co-factors of all the elements of the Matrix. 3 Put these co-factors in co-factor Matrix. 4 Find the Ad joint of this matrix by taking the Transpose of a Matrix of the co-factor matrix. 5 Now Multiply Ad Joint of Matrix with the reciprocal of Determinant value of the given Matrix. This Method is very confusing, Long and time Consuming. So Let us have a New, Easy and Shortcut Method . If we have to find the Inverse of 2×2 Matrix then Follows these steps. 1 Interchange the position of the elements which are a11 and a22 . 2 Change the Magnitude of the elements which are in position a12 and a21 . 3 Divide every elements of the given Matrix with its Determinant value. 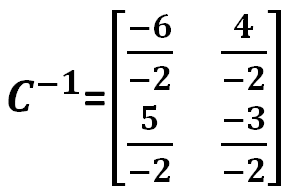 To find the Inverse of this matrix just interchange the position of elements a₁₁ and a₂₂ i.e Interchange the positions of elements 5 and -3 and in second step change the magnitude of the elements which are in positions a12 and a21 i.e. change the sign of 9 and 4. Now Expanding this Matrix to 5×5 Matrix by adding 4th Row as repetition of 1st Rows and adding 5 Row as repetition of 2nd column as what we received in last step. 4 Now Find the co-factor of 1st element of 2nd Row i. e. 2, which is equal to determinant value of the Matrix (RED below ) obtained by eliminating the 2nd Row and 1st Column which will be -2*(4)-(6)*(-1) = -2,write this co-factor value in 2nd Column of 1st Row . (we are evaluating co factors row wise and writing Column wise) . 6 Find the co-factor of 3rd element of 2nd Row i. e.5, which is equal to determinant value of the Matrix (RED ) obtained by eliminating the 2nd Row and 2nd Column which will be 5× (-1)-(-2) × (5) = 5,write this co-factor value this 2nd Column of 3rd Row, write this co-factor value in 2nd Column of 1st Row . (we are evaluating co factors row wise and writing Column wise ) . so we have -17 ,-17 and 17 as co-factors of 3rd Row, write these co factors in 3rd column . 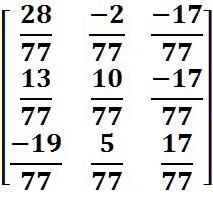 Now divide with the determinant value of given 3×3 Matrix , which will be 5(28)-1(-13) + 4(-19) = 140 + 13 -7 6 = 77. This post was regarding short cut methods of finding Inverse of 2×2 and 3×3 Matrices , If you liked this post ,Please share your precious views on this topic and share this post with your friends to benefit them. we shall Meet in the next post ,till then BYE .